Nano/micromotors exhibiting regulated motions are ubiquitous in nature, with biological ones having highly sophisticated and functional properties. However, nano/micromotors have not been applied in the design of useful man-made chemical systems to our knowledge. In this article, we review artificial nano/micromotors that have been proposed in the last decade. The underlying physics is completely different from that of conventional macroscale motors. The viscous force dominates the regulated motion of a nano/micromotor, in which thermal fluctuation converts into active Brownian motion. To overcome the viscous force and sustain motion, motors driven by various types of mechanisms have been fabricated. 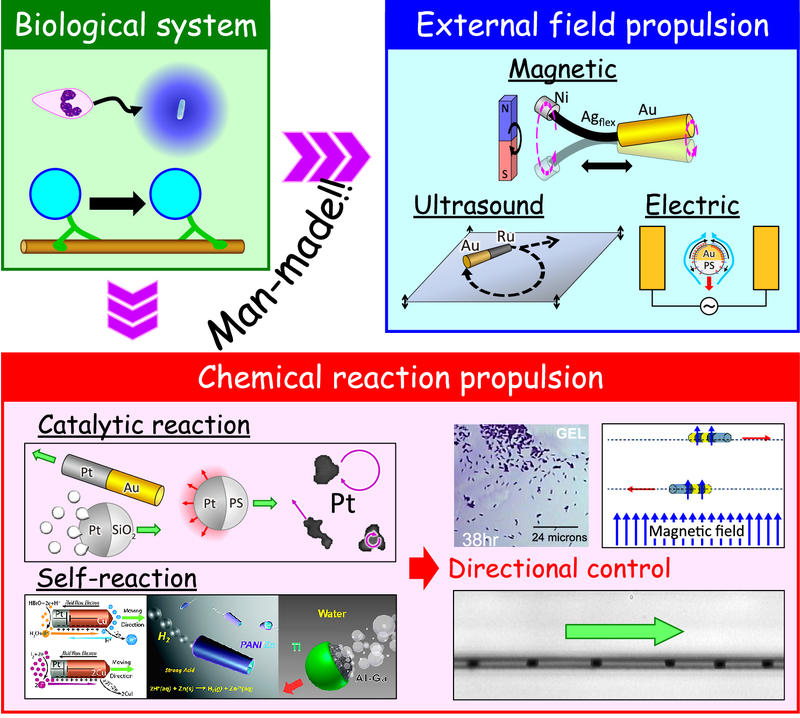 We focus on chemical reaction propelled motors classified into catalytic and self-reacted ones because most biomotors move by consuming chemical energy. Furthermore, the directional control of artificial nano/micromotors by chemotaxis, external field, and confined space is also discussed. As this hot and challenging topic is still currently at a fundamental stage, practical research will be required for developing various applications. We expect that chemical systems mimicking elegant biological ones will be realized in the near future. The preparation of nano/micromotor systems has been a hot topic in nanotechnology and biotechnology for the last decade. This review explains the underlying physics of the nano/micromotors, which is completely different from that of conventional macroscale motors. Additionally, the authors introduce various types of nano/micromotors, especially chemical reaction propelled motors. 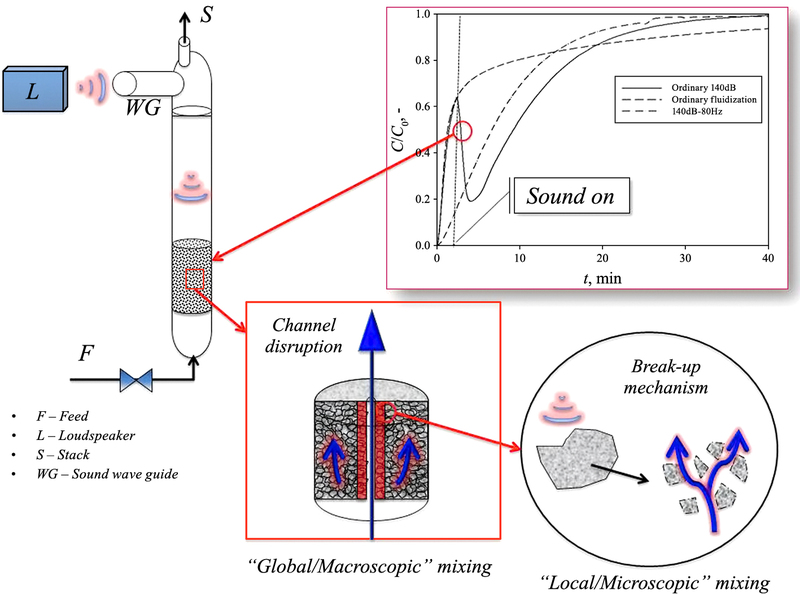 The present work is a review presenting the main results obtained by our research group in the field of sound-assisted fluidization of fine particles. Our aim is to highlight the role of acoustic fields in enhancing the gas-solid contact efficiency, with specific attention to the phenomenological mechanism upon which this technique is based. In particular, the first section presents the characterization of the fluidization behaviour of four different nanopowders in terms of pressure drops, bed expansion, and minimum fluidization velocity as affected by acoustic fields of different intensity and frequency. The fluidization of binary mixtures comprising two powders is also investigated under the application of different acoustic fields and varying the amounts of the two powders. The second section focuses on the study of the mixing process between two different nanopowders both from a “global/macroscopic” and “local/microscopic” point of view and highlighting the effect of mixture composition, primary particles density and sound intensity. The last section presents a promising application of sound-assisted fluidization, i.e. CO2 capture by adsorption on a fine activated carbon, pointing out the effect of CO2 partial pressure, superficial gas velocity, sound intensity and frequency on the adsorption efficiency. In spite of the widespread application of settling suspensions, their inherent complexity has yet to be properly predicted by a unified numerical model or empirical correlation, and usually industries still possess customized charts or data for their particular suspension. This is, clearly, rather inefficient and can lead to oversized dimensioning, low energy efficiency and even operation limitations/difficulties. In this manuscript a review of empirical correlations, charts and numerical models that have been employed to predict the behaviour of settling suspensions is briefly described, providing information on the advantages and drawbacks of each method. Their evolution throughout the years: from Durand and Condolios correlations, to empirical models by Wasp, single phase simplifications with mixture properties by Shook and Roco, and to other Euler-Euler or Euler-Lagrangian numerical models, will be presented. Some considerations on recent particle migration and turbulence modification publications will be added. In addition, information about some current CFD application of Lattice-Boltzmann and Discrete Element Method (DEM) will be given. Lastly, data from CFD modelling employed by the authors that is able to predict turbulence attenuation in settling flows with medium sized particles for different concentrations is reported. Ion-induced nucleation (IIN) mechanism has been widely accepted as an efficient source of new particle formation in the middle and upper troposphere. However, there have been debates on its contribution to the nucleation events observed in the boundary layer. 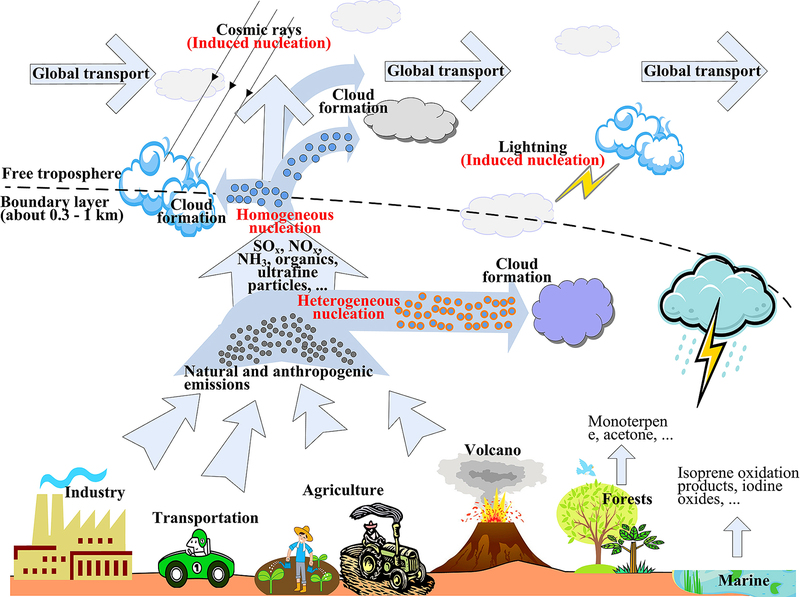 To reveal the current understanding of IINs, we here summarise investigations on microphysical mechanisms of aerosol formation from ions, i.e., ion induced homogeneous nucleation (HN). 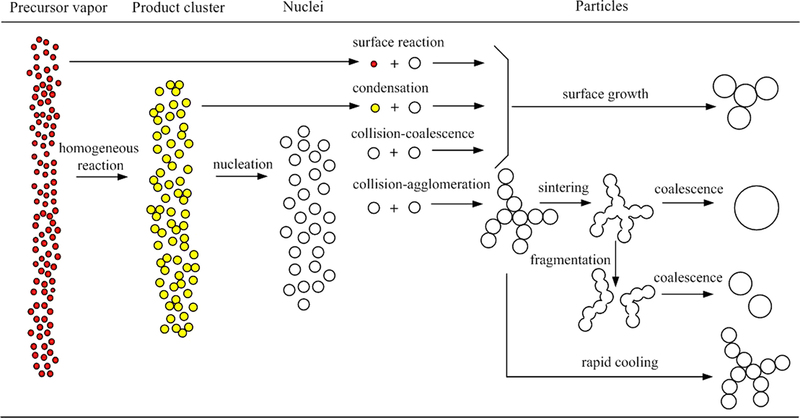 The basic formation steps of ion-induced HN include primary ion production, charged cluster formation from ions, and stable nanoparticle formation from clusters. Two essential controlling processes (ion generation and formation of condensable species) are emphasized in the viewpoint of plasma performance for three case studies, i.e., galactic cosmic ray travelling in the troposphere, lightning discharges, and charging processes by aerosol chargers. The first two cases result in IINs due to the simultaneous generation of ions and condensable species (such as H2SO4 and oxidized organic vapours) from oxidizing trace atmospheric molecules. 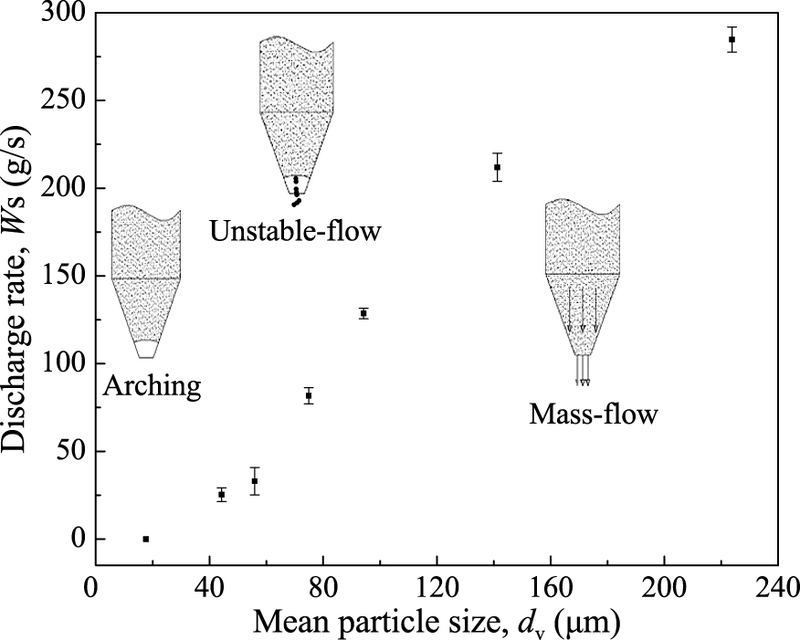 The third case leads to ion-induced clustering or nucleation in aerosol chargers. Due to a relatively short residence time in chargers (normally less than 1 minute), big charged clusters often exist in the outgoing aerosol flows. 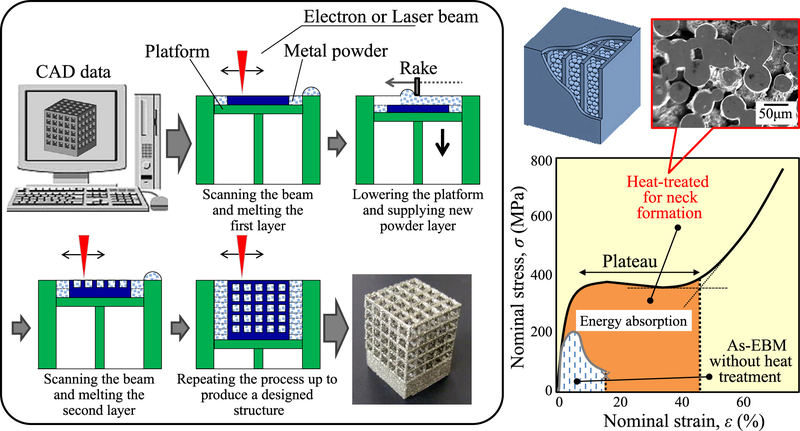 Powder-based additive manufacturing (AM) technology has increasingly attracted attention because it realizes fabrication of arbitral three-dimensional structures with a great degree of freedom at high speed, which is almost impossible using conventional manufacturing tools. In early times, AM was known as a rapid prototyping (RP) which merely aimed at a trial prototyping of products mainly from resin materials. Today, thanks to the progress in the heat source, optical system, raw material production, etc., the expected role of AM has dramatically changed into a direct fabrication of final or near-final products made from a variety of materials from resins to ceramics, metals, and intermetallic compounds. Because the powder-based AM is a bottom-up manufacturing method, it offers a big advantage for the small-lot production of a wide range of products; therefore, tailor-made product portfolio is a potent target of AM. In this review paper, the advantage and possibility of AM in the development of functional metallic biomaterials for orthopedic usage is described. Medical treatments need to be flexibly done in accordance with individual pathological conditions and constitutions, therefore, the function of a medical device should be tunable, which is quite a strength of AM. The many characteristics of nanoparticles (NPs) depend on their size and size distribution. When novel functions of NPs are attempted, it is necessary to monodisperse or nearly monodisperse NPs. Many synthesis methods have been proposed from solution-based chemistry to satisfy this demand. 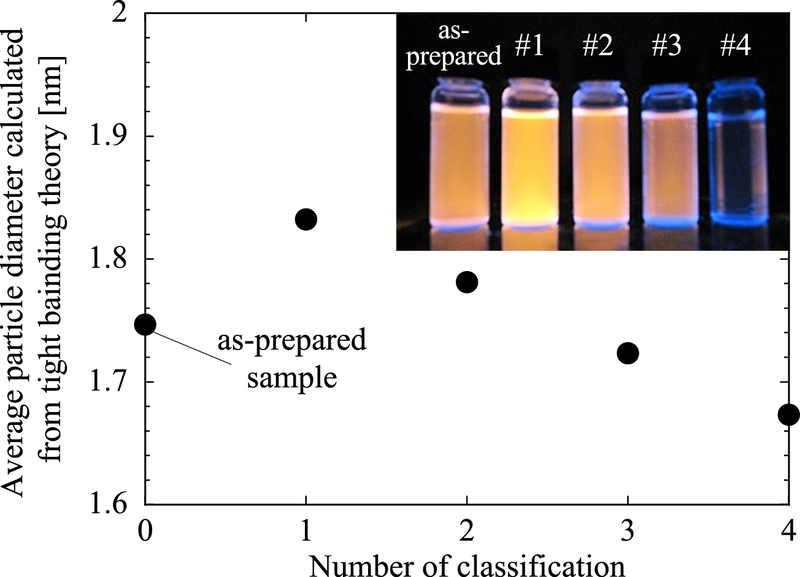 Despite such special techniques to prepare NPs, it is often the case that an additional classification procedure is needed to a certain extent to obtain monodispersed NPs, similar to other general precipitation methods used in NP preparation. Additionally, NPs must be purified post-synthesis to remove by-products. Hence, size-selective separation as post-synthesis operation is expected to become increasingly important. In this review, some recent developments of size-selective separation methods for NPs based on using external fields, filtration, and the stability of the colloid system are highlighted. Heterogeneous non-catalytic gas-solid reactors are commonly used in the production of chemicals, metals and metal oxides, for example, rotary drum reactor for producing quick lime; blast furnace, a moving bed reactor for producing iron, etc. Industrial processes involve multicomponent mixtures of solids as most of the naturally occurring materials such as minerals are multicomponent in nature. Generally the raw materials are heterogeneous and their physical and chemical characteristics vary from one source to another. The solid particles are also usually moist, the moisture content varying from season to season. The physico-chemical phenomena that take place in these reactors include flow of gases through porous media, heat transfer between the gases, solids, equipment and the environment, evaporation and condensation of moisture, reactions between gases and solids and within a single phase, melting and solidification depending on the temperatures inside the reactor, etc. The flow of particles is also of great importance especially in rotary drum and moving bed reactors. General features of the mathematical models for non-catalytic reactors are described along with models for the phenomena mentioned above. Case studies from the iron and steel industry on model-based optimization of production of direct reduced iron in a rotary kiln and induration of wet iron ore pellets on a moving packed bed reactor are discussed here. The objective was to investigate the effect of dry coating of salbutamol sulphate (SS) with magnesium stearate (MgSt) on the kinetics of powder de-agglomeration. 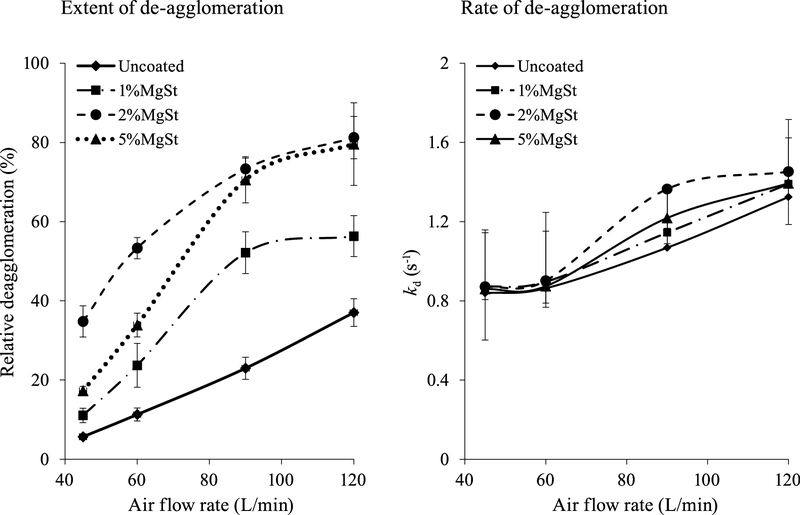 The relative de-agglomeration of the MgSt coated SS powders was higher than uncoated SS at all air flow rates; the SS coated with 2 % MgSt showed the highest extent of de-agglomeration (> 5 % MgSt coated SS > 1 % MgSt coated SS). 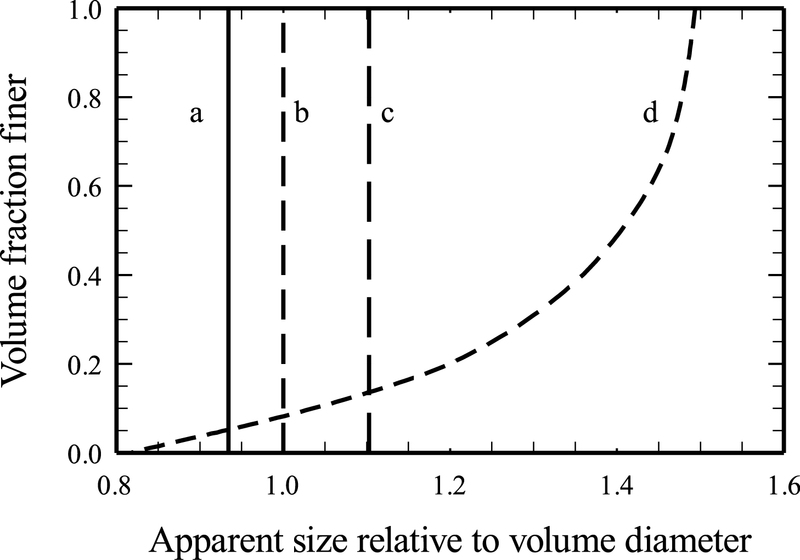 Rate of de-agglomeration was described by a cumulative de-agglomerated versus time profile. Profiles fitted a mono-exponential model and the de-agglomeration rate constant (kd) was estimated. No significant differences existed between any of the uncoated and coated powders. The significance of this study relates to the improved aerosolization and de-agglomeration performance of the MgSt coated SS powders with optimum performance of 2 % MgSt coated SS. More significant is the finding that no change existed in de-agglomeration rate constants between the coated and uncoated powders, with the potential implications that their aerosol plume concentration and deposition patterns were similar. This paper reports on an extensive experimental campaign aimed at studying on effect of particle size and flow mode on the flow characteristics of pulverized coal. A series of pulverized coal changing the mean particle size in the range 18–224 μm were used as the experimental materials and three flow modes including gravity-induced flow, downwards and upwards mechanically forced flow were investigated. The gravity-induced flow was characterized by discharging pulverized coal from the Perspex hopper gravitationally, while the mechanically forced flow was performed inside a cylindrical vessel where the blade rotated and moved downwards or upwards to displace the pulverized coal. Furthermore, the relationship between different flow modes was discussed and the force analysis was used to reveal the flow mechanisms of gravity-induced flow. We have successfully synthesized (Ni,Al) co-doped ZnO nanostructured powders via the sol-gel technique at low temperature. The elemental analysis confirms the incorporation of the Ni and Al ions into the ZnO matrix. The structural study revealed that the nanopowder samples are assembled in flower-shaped Zn0.9-xNi0.1AlxO nanostructures with average crystallite sizes ranging from 39 to 53 nm. The XRD patterns show that the Zn0.9-xNi0.1AlxO nanopowders have a hexagonal wurtzite polycrystalline structure. Weak diffraction peaks related mainly to nickel oxides are also detected in the samples. The highest crystallite size, lowest lattice parameters and unit cell volume are obtained for the nanopowder samples that contain 1.5 at.% of aluminum. 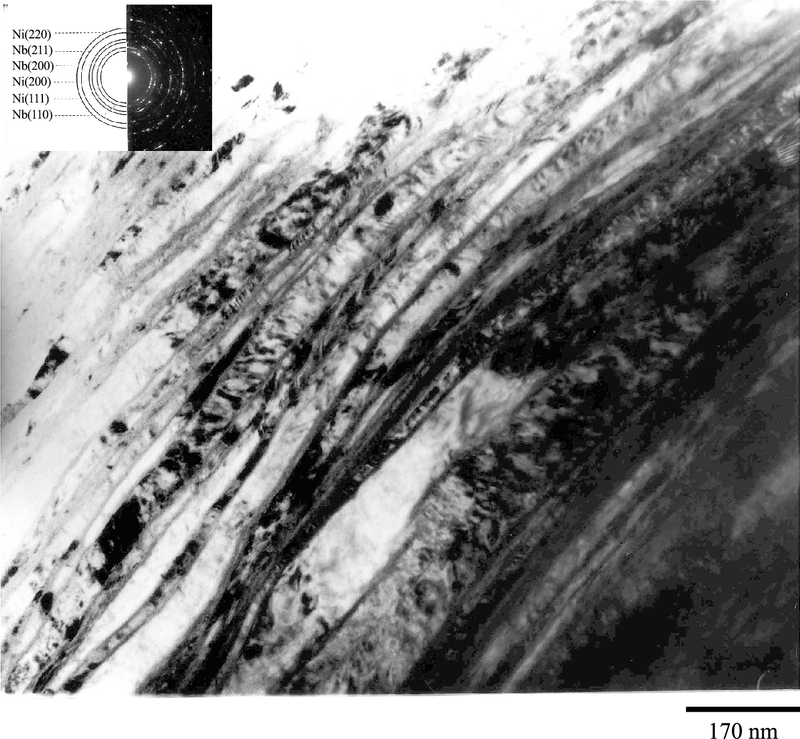 The decomposition process of the dried gel system is investigated by thermogravimetric analysis (TGA). Raman scattering and FT-IR measurements confirm the wurtzite structure of the synthesized Zn0.9-xNi0.1AlxO nanopowders. The energy band gap of the synthesized nanopowders (~3.32 eV) was estimated by using the Brus equation and the crystallite sizes obtained from XRD data, for comparison. The strain in the nanopowder samples (~2.7 × 10–3) was also calculated according to the Stokes-Wilson equation. 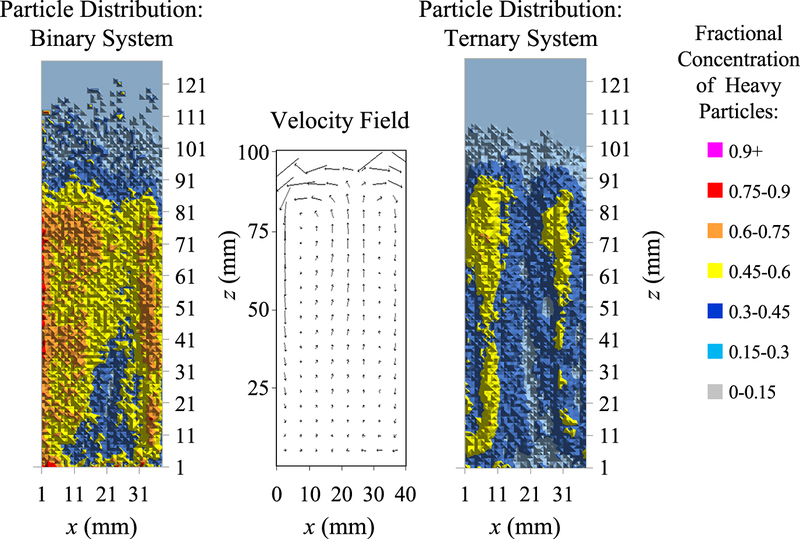 We present a first experimental study of density-induced segregation within a three-dimensional, vibrofluidised, ternary granular system. Using Positron Emission Particle Tracking (PEPT), we study the steady-state particle distributions achieved by binary and ternary granular beds under a variety of differing system parameters. In doing so, we determine the extent to which the segregative processes in ternary systems resemble their comparatively well-researched binary counterparts. We examine the influence of particle elasticity on the system, demonstrating the existence of a significant parameter range for which the effects of inelasticity-induced segregation may be safely neglected. Finally, we investigate the existence of a causal link between convective motion within a system and the segregative behaviours observed. The surface properties of the synthesized Ce-bastnaesite were determined by the electrophoresis technique. The point of zero charge (PZC) of this mineral occurs at pH 7.8. A sample of natural bastnaesite [(Ce, La) FCO3] from the Mountain Pass deposit in California, USA was also studied through electrokinetic measurements. The mineral was found to behave essentially like a carbonate with its PZC occurring at pH 9.2 and pCO3 6 in aqueous solutions. The isoelectric point of synthetic Ce-bastnaesite as obtained by equilibrium pH measurements occurs around pH 7.8, which agrees reasonably well with the equionic point of pH 7.3, computed on the basis of thermodynamic data and pH of minimum solubility for Ce bastnaesite, namely pH 7.6. 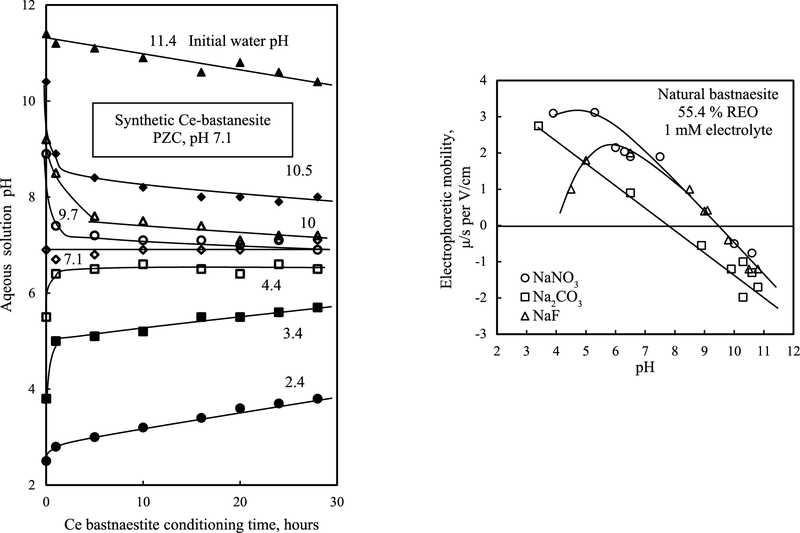 Measurements reported in the literature on relatively pure samples of bastnaesite do exhibit PZCs closer to the value of pH 7.8, as measured by us for synthetic Ce-bastnaesite. It is well known that diesel fumes are carcinogenic to humans and may cause inflammation of the respiratory tract, cardiovascular problems, etc. Diesel exhaust particles (DEPs) occurring in diesel fumes are fractal-like aggregates with diameters ranging between 10 and 2000 nm, with various compounds adsorbed on their surface. The fractal-like structure of DEPs and their nanosize leads to the problem of theoretically predicting the DEPs’ filtration efficiency. Thus, experimental studies on effective protection against DEPs as well as theoretical modeling are essential. 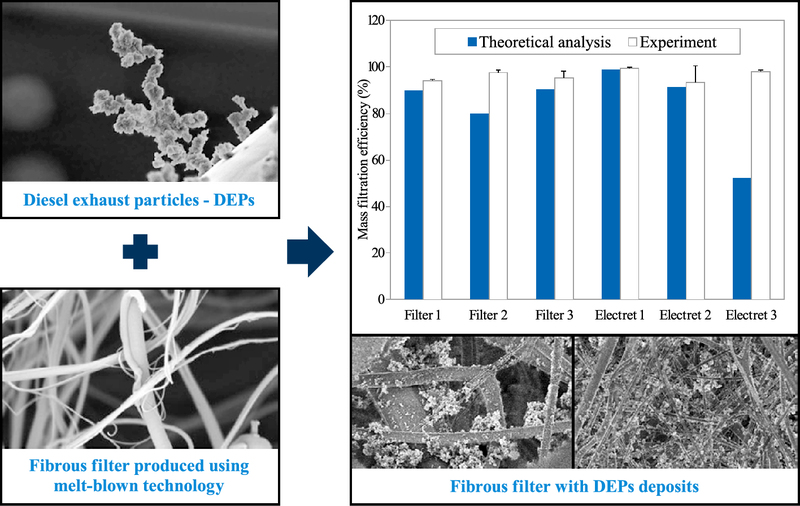 This study analyzes both experimentally and theoretically the mechanical and electret filters and their potential effectiveness in the filtration of DEPs. 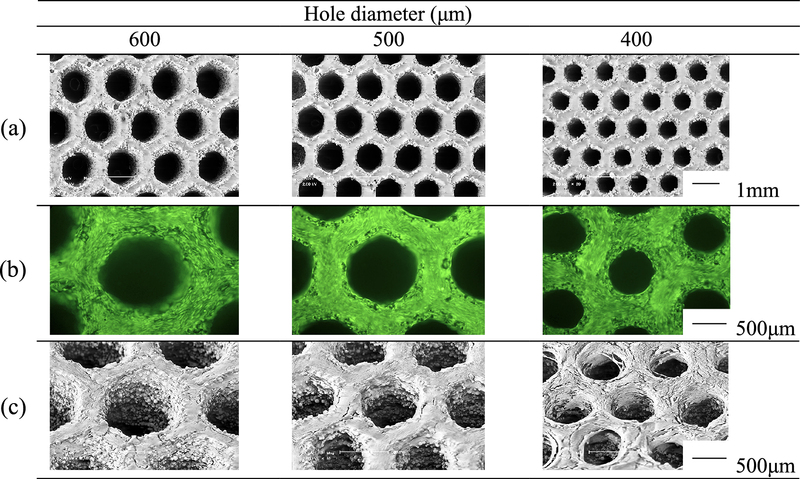 The theoretical analysis of the filtration process on fibrous fabrics was performed using classic filtration theory, assuming that the filtration layer can be treated as a system of a single fiber located in the Kuwabara cell. The experimental results show that the fibrous filters, produced using melt-blown technology, provide a high level of protection against DEP aerosols (93 %–99 %). The obtained filtration efficiencies are (in some cases) even higher than requested for particulate respiratory half-mask type 2 (made from a fibrous filter). However, the theoretical results obtained using classic filtration theory indicate lower filtration efficiencies than the experimental ones. Elemental Ni-Nb powder mixture containing 40 atom % Nb were mechanically alloyed in a low energy ball mill, allowing slower processing and easier progressive observation at intermediate milling times. The evolution of morphology and structure of the powders were investigated as a function of milling time by transmission and scanning electron microscopy and X-ray diffractometry. The results revealed that an ultrafine Ni/Nb layered structure with a typical thickness of ~30 nm, containing nanoscale size grains with a typical size of ~15 nm, develops in powder particles during mechanical alloying. This microstructure provides numerous high speed diffusion paths such as sub-grain boundaries and dislocation networks, allowing a high diffusion rate at low temperature and therefore permits different solid-state reactions to take place kinetically. Under mechanical alloying conditions used here continued milling led to a fully amorphous structure. Because of non-uniform plastic deformation the kinetic requirements for the amorphization reaction at the edges of particles is satisfied prior to the centres, resulting in an inhomogeneous progress of amorphization reaction from the edges towards the centres of particles. Super absorbent polymer (SAP) sorbs copious amount of liquid water but its sorption power for water vapor is quite low. 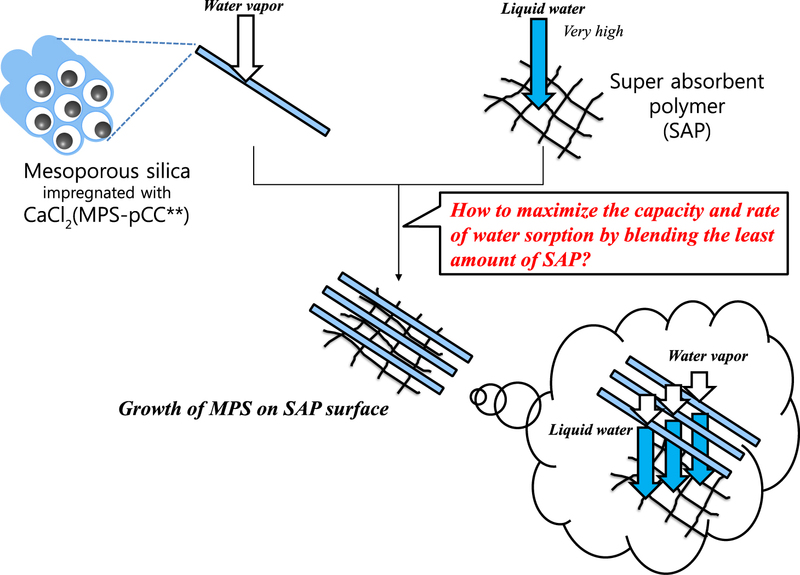 On the other hand, mesoporous silica loaded with CaCl2 (MPS-CC) has high sorption capacity for water vapor. However, this is determined by the salt loading, which is limited due to its corrosiveness. Even by simple powder blending of 75 mass% of SAP and the balance of MPS-CC (SAP75/MPS-CC25), the 3-hour maximum specific water uptake (g H2O/g sorbent) reached the maximum, 3 times the equilibrium uptake of MPS-CC. The sorption property was further enhanced by developing a new sorbent in which mesoporous silica was grown on the surface of swelling SAP and then impregnated by CC in ethanol. In the new sorbent (SAP-iMPS-CC), MPS grew organized, straight and lengthwise by the help of SAP. Owing to such intimate contact between MPS and SAP, the 3-hour specific water uptake of the new sorbents grown for more than 24 h (SAP-iMPS-CC24) was kept constant at the value of 2 times that of SAP75/MPS25. 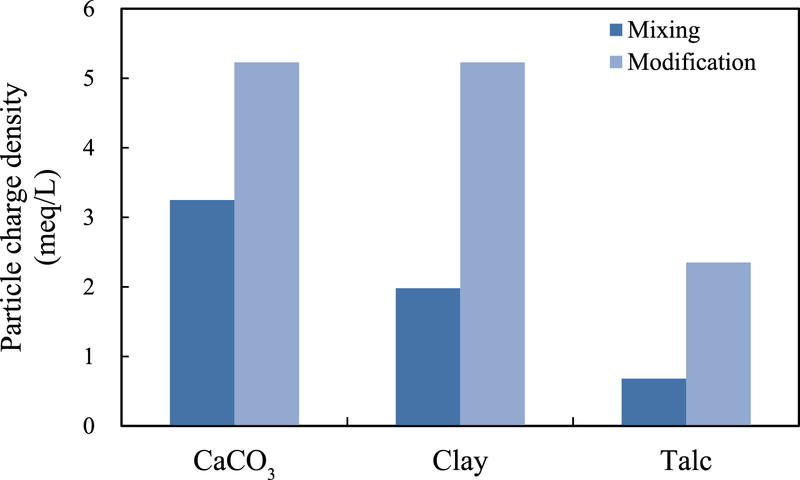 The SAP mass% of SAP-iMPS-144 could reach 25 without the sacrifice of sorption capacity. Magnetic-field-assisted fluidization is starting to be considered as a viable alternative to standard fluidized beds for those operations (such as particle separations, filtration, adsorption) in which the solid phase can be made of magnetic particles or, alternatively, the fluidizing agent is a ferro-fluid; thus the fluid bed responds to the action of magnetic fields, and stabilized fluidization regimes can be generated.One of the major difficulties to be tackled is the development of a predictive model capable of estimating the stabilized-to-bubbling transition velocity for a given magnetic field or, on the other hand, the magnetic field intensity required to stabilize the bed to a quiescent condition. The fluid dynamics prediction of a stabilized bed is also a challenging task at the moment.On this basis, a very simple model for the description of MSFB was derived in this contribution starting from basic fluid dynamics and magnetodynamics equations. The model was implemented in a commercial CFD code in order to simulate the effect of the magnetic field onset on a freely bubbling fluidized bed. Standard procedure in particle size analysis is to express size as an equivalent sphere diameter. As a consequence, results obtained by procedures based on different kinds of response give different results. An alternative approach is presented based on a spheroidal shape which, depending on elongation can represent shapes ranging from rods, through spheres to discs. Particle size and shape are then presented as volume diameter and elongation. Applications to commonly used procedures are presented. For particles of similar shape, i.e., elongation independent of size, the results of procedures such as sieving, microscopy and sedimentation show a simple shift in apparent size with the form of the distribution unaffected. In the case of methods based on radiation scattering, orientation effects lead to an apparent size distribution even for identical particles. Experimental results on glass spheres, crushed quartz particles and fine kaolin are shown to be consistent with the spheroid model. Analysis of the quartz data by a variety of techniques gave consistent values for the volume diameter and elongation. Light scattering measurements on a series of narrow sieve fractions of the quartz particles showed no variation in elongation with size. As a consequence of increasing computer power and more readily useable commercial and open source codes, Discrete Element Method (DEM) is becoming widely used across a range of applications to simulate increasingly complex processes. This is exacerbating the challenge of setting up simulations for industrial applications. The literature on input parameter selection is divided. A number of papers report methods for their direct measurement. 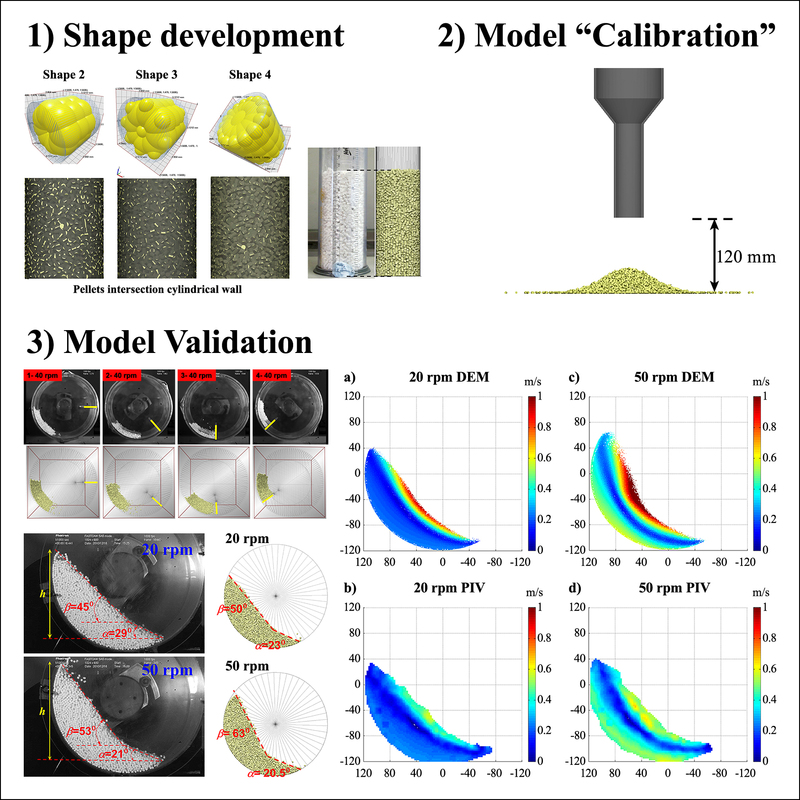 Others, by contrast, propose a “calibration” approach where the particle properties are derived as adjustable parameters by quantitative comparison of experimental and simulation results. This paper reports on the calibration and validation of the input parameters for the specific case of cylindrical tablets represented by conjoined spheres. The initial steps are to not only assign and optimise the DEM input parameters but also optimise the shape representation; what degree of linearity of the edges and angularity of the corners are required to accurately reflect the cylindrical shape. The model was used to simulate two configurations of a rotating drum: an “attrition tester” with a single longitudinal baffle and an un-baffled drum. The results were compared qualitatively and quantitatively with experimental data. While the qualitative comparison was good in most cases, detailed quantitative comparison fared less well, with some significant errors. This study highlights some of the key issues for a wider-spread of industrial applications for DEM. As Discrete Element Modelling (DEM) increases its utilization as tool for the simulation of particulate materials in a variety of processing unit operations, there is a continuous focus on develop robust methodologies for model calibration to guarantee reliable predictive results. This paper focus on providing insights on advantages and limitations on typical approaches for calibration and validation. The calibration process using a series of small scale tests was then validated experimentally and numerically utilizing independent application tests. Titanium and its alloys have been widely used for various industrial and medical applications because of their excellent characteristics of low density, high corrosion resistance and high biocompatibility. However, it is not easy to produce the more complicated shape and precise components with low cost because of their poor workability. Therefore, Direct Laser Forming (DLF) which is one of Additive Manufacturing (AM) techniques is desired to be a suitable and advanced processing technique for fabricating Ti alloy components. In this paper, DLF technique has been introduced to fabricate Ti-6Al-7Nb alloy parts for medical applications and Ti-6Al-4V alloy parts for aerospace and automobile by evaluating various properties. (TiCp + TiBw)/Ti composite was firstly prepared by spark plasma sintering (SPS) and hot extrusion from Ti-B4C system, and then isothermally heat treated at 400–800 °C for 24 h to study the pinning effect of the in situ formed reinforcements. Microstructure and phase composition was investigated by SEM, XRD and TEM, variation of the grain size of Ti matrix was studied by EBSD analysis, and room temperature strength was also measured after different heat treatments. 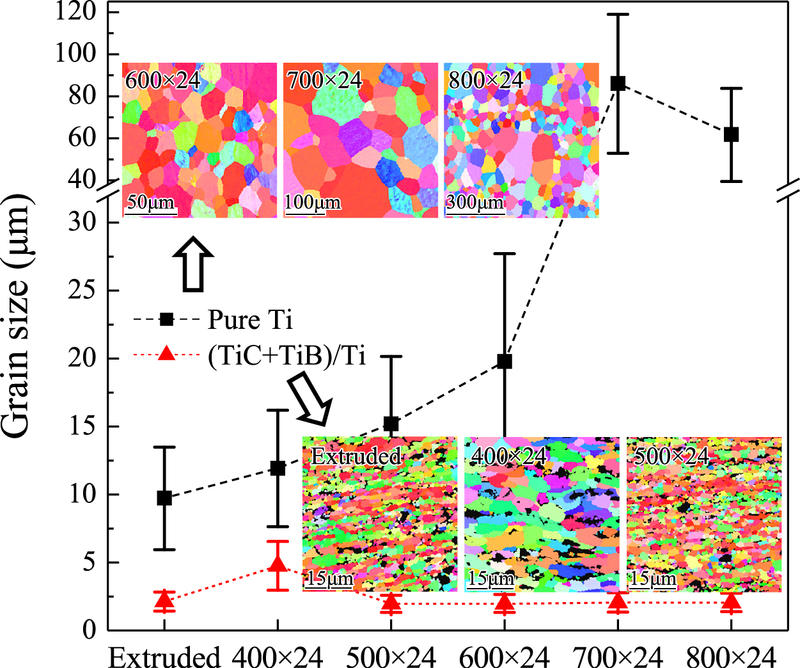 Results show that, comparing with pure Ti materials, both the grain size of Ti matrix and the room temperature strength of the composite almost keep stable after heat treatments, suggesting the pinning effect of in situ formed TiCp and TiBw is effective to suppress the growth of Ti matrix grains during heat treatments. In this study, functional composite-pigment was prepared by a dry impact-blending method, using the inorganic materials used for coating of titanium dioxide, GCC, clay, and talc. After considering the particle size of inorganic pigment, the selected core powder and fine powder were mixed at a suitable mixing ratio. When powder was electrified, their fine particles could adhere by static electricity on the larger ones termed ‘core particles’, and then form an ordered mixture. During the surface modification of pigments, the energy caused by fine powder adhering to core particles was measured, and utilized in examining the efficiency of the change of particle size surface modification. Afterward, these were susceptible to being composited by impact force, resulting from very high-speed air circulation. After putting these surface modified pigments in water, their static electricity properties were measured by particle charge detector and Zeta potential tester. From these results, it was revealed that the elemental powder properties of papermaking inorganic pigment could be improved. Produced and listed by : Nakanishi Printing Co.Ltd.